A South Belfast community leader has paid tribute to the outgoing Irish president, who he described as “fearless” in her cross-community work here. 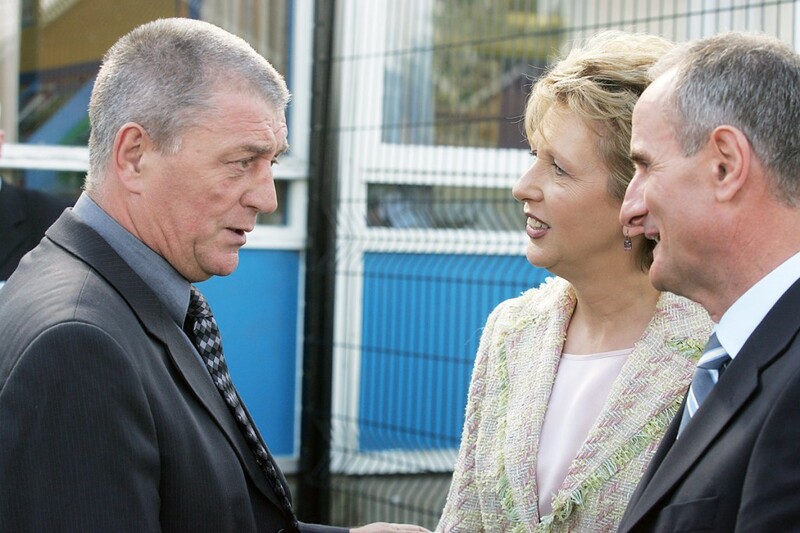 Jackie McDonald, widely seen as the leader of the UDA, formed a close friendship with Mary McAleese and her husband Martin over the course of her 14 years as the eighth president of Ireland. As she stepped down last week to be replaced by Michael D Higgins in the role, Mr McDonald said she had been a “great leader” for both the south and north, and had fostered good community relations here during visits. “She came to Taughmonagh Primary School in 2005 not long after she made the comments comparing Protestants to Nazis. There was a fear someone would carry out some retaliation. “It was also not long after Johnny Adair was released from prison and the security was increased because of the threat from his faction. She was advised not to go and it wasn’t easy for her to do so but she still turned up. President McAleese made several trips to South Belfast during her tenure, including the Taughmonagh visit and Belvoir Primary School in 2009, not long after the school had announced it would be teaching students in the predominantly loyalist estate Gaelic games. Her last visit to South Belfast in a presidential capacity was late last year when she officially opened the renovated Shaftesbury Recreation Centre in the Lower Ormeau. Mr McDonald said her work had been a huge contributor to the peace process. “Before we started going down to meet with her, people down there had preconceived notions about loyalists and likewise we thought certain ways about republicans. “But those visits changed our world – we were going to the Áras when we weren’t even being invited to Stormont. The Secretary of State wouldn’t see us but Mary and Martin would. Jackie said he and other loyalists would attempt to maintain good relations with Áras an Uachtaráin, beginning at a Belfast Media Group event tomorrow (Thursday). “I’ll be attending the Aisling Awards and Taoiseach Enda Kenny is the guest of honour. If I get a chance I will try and speak to him and certainly I will tell him we want to keep our relationship with the Irish president up. “It would be a waste to let all that good work disappear and while Martin McAleese is a senator there will still be a channel there for us but it would be good to wish Michael D all the best in person.